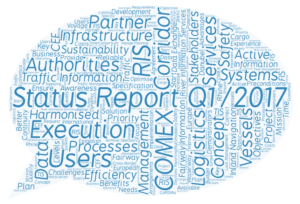 The first quarter of 2017 was focusing on the finalisation of the project starting phase: The RIS COMEX Kick-Off meeting was held mid of January in Berlin, the RIS COMEX Work Programme was finalised and sent to the Steering Committee for approval, the RIS COMEX Corridor Service List as part of the RIS COMEX Master Plan was finalised and agreed on. Furthermore, the Action Status Report 2017 for the reporting period 2016 was elaborated, finalised, approved by all Beneficiaries and successfully submitted towards the Innovation and Networks Executive Agency (INEA) that is managing the technical and financial implementation of the Connecting Europe Facilities (CEF) programme of the European Commission. Mid of February a meeting among the Sub-Activity Leaders of Activity 2 and of other interdependent Sub-Activities took place in Brussels in order to discuss the work approach as preparation for the official Activity 2 Kick-Off Meeting that was organised on 30th March in Vienna to initiate the work to be executed related to the investigation and detailed definition of the Corridor Services.